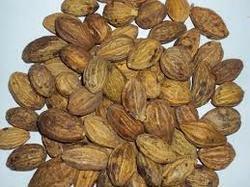 We are a leading Exporter of harde extract 80% (terminalia chebula) from Ahmedabad, India. Haritaki fruit extract is also widely used in many Ayurvedic formulas for the improvement of the liver, colon and spleen therefore it is said to be a digestive tonic. Many research studies do indicate that Haritaki oil obtained from the seeds have certain substances that can increase the motility of the gastrointestinal tract. It functions similar to that of castor oil. The fruit extract obtained from haritaki is also reported to contain a substance that has anti-bacterial and anti-fungal properties. It is also used in the most famous formulation known as Triphala; it is used in combination with two herbs to prepare this formulation. This medicine Triphala is widely used for anti-aging activity and to increase the body’s immunity. Looking for Harade Extracts ?